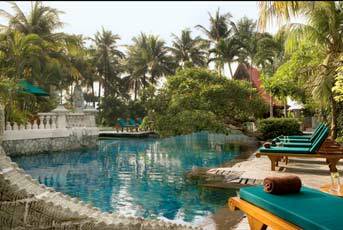 Link with the lifestyle of Surabaya in the center of the town, at the Sheraton Surabaya Hotel & Towers. At your doorstep you can discover the popular Tunjungan Plaza and Asia Market. All the guestrooms have a contemporary design and have state-of-the-art technological innovation. The guestrooms have free of charge Internet connection. For golfers looking to relax after their round of golf the hotel provides a Fitness center, an outdoor swimming pool, and Pakuwon Golf & Family Club, managed by Sheraton Hotels & Resorts, for family fun.